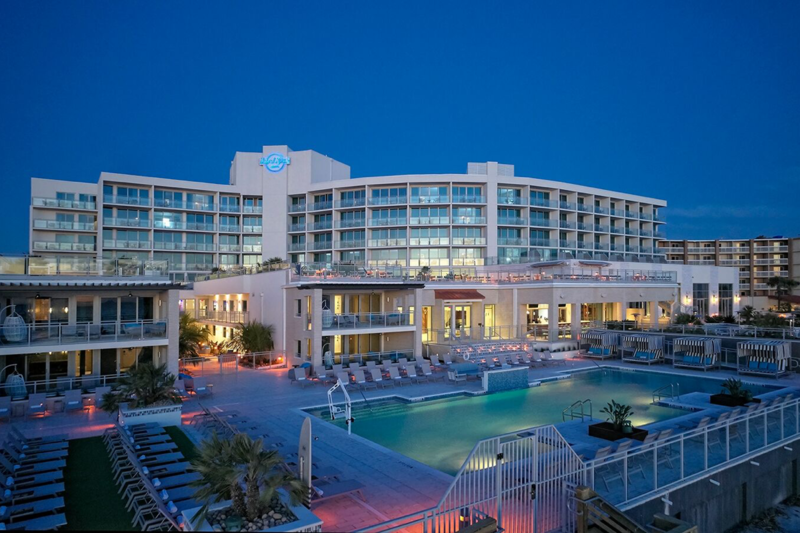 January 29, 2019 — Daytona Beach, FL —Hard Rock Hotel Daytona Beach has switched on an entirely new approach to travel marketing with Flip.to, the advocacy marketing platform for hotels and travel brands. Flip.to lets guests share their Hard Rock experience worldwide, debuting the property to a massive audience by opening up an entirely new marketing channel. The platform closes the loop on these conversations sparked, delivering authentic, personal conversations to inspire & win over new travelers for the hotel. 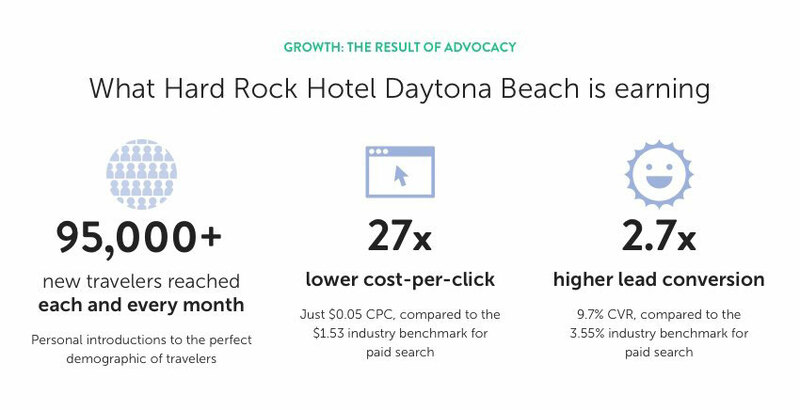 For Hard Rock Hotel Daytona Beach, that’s made a measurable impact for their business, earning nearly 100,000 in monthly reach, and tens of thousands of dollars in direct revenue so far. Opening its doors to guests in March of 2018, Hard Rock International brought modern luxury to the Daytona Beach market in partnership with Summit Hospitality Management, who invested $40 million into the 200-room beachfront property. It’s since set the bar for an entirely new level of guest experience in Daytona, earning its AAA 4-Diamond status just five months after hosting travelers for the first time. Beyond the hotel’s extensive renovation, raising awareness and attracting travelers for this new Hard Rock experience was a critical piece of a successful launch. That charge was lead by industry-leader and years-long user of Flip.to, Susan Keaveney, Hard Rock Hotel Daytona Beach’s inaugural Director of Marketing. Keaveney joined her post in October of 2017—just six short months prior to the hotel’s opening. She quickly aimed to drive demand for the newly minted property that was soon to be at the top of its market. Knowing the proven results of the platform and its ability to net immediate impact, Keaveney saw Flip.to as the a perfect fit to start inspiring travelers. With this in mind, Keaveney launched the platform in April of 2018 to start powering growth for their property and top her goals. “As a new concept to the area, we were on a strict timeline and budget to increase the visibility for this unique Hard Rock experience with the right travelers—everyone from families seeking one-of-a-kind vacations, to those dialing-it-up at one of our events. This meant promoting the authentic spirit that defines the brand to a wide audience that was still highly targeted. 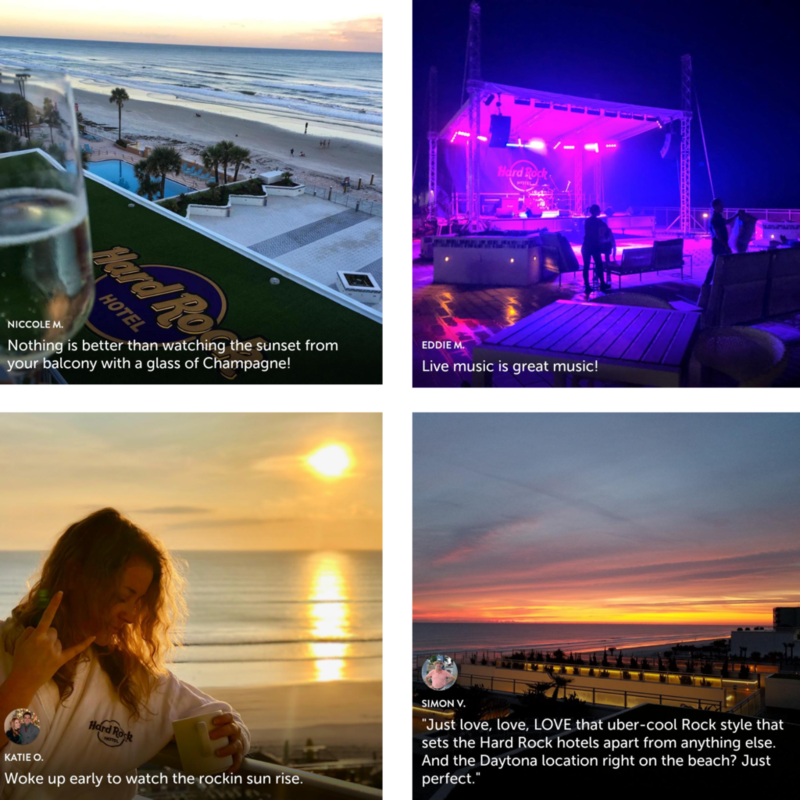 With Flip.to, Hard Rock Hotel Daytona Beach are reaching a new audience of nearly one hundred thousand organically each and every month, totaling more than 860,000 in reach, so far. This drove more than 52,000 unique site visits and 5,000+ opted-in, warm leads for travelers interested in a trip to the Hard Rock in just the first 9 months, a remarkable 2.7X better than the industry benchmark for paid search, and a testament to the receptive warmth of the audience and quality demographic. Add to that tens of thousands of dollars in directly booked room revenue, and the platform has made a lasting impression for Hard Rock Hotel Daytona Beach. Performance compared to the travel industry paid search benchmarks. With 9 months on the platform, Keaveney and the Hard Rock Hotel team are looking ahead to even more growth on the platform. Together with Flip.to they’re crafting rich experiences to put the newest member of the Hard Rock International brand at the center of every traveler’s journey. “Hard Rock Hotel Daytona Beach provides experiences guests won’t soon forget, and are excited to share on. Flip.to has been key in tapping into what’s well known as an influential factor in choosing travel: recommendations from friends & family. And the impact of the platform extends even far beyond that, with quality that’s simply unmatched. “I was an early adopter of the Flip.to platform, and now have been a customer spanning it’s growth at multiple properties I’ve marketed. As the landscape evolved, so too has the platform, bringing solves to the table that truly set out to make travel better for everyone, business and traveler included. Stories and experiences shared by recent travelers to the Hard Rock Hotel Daytona Beach. Embodying the essence of the Hard Rock brand—a kinetic spirit that’s ageless and electric—panoramic ocean views and legendary amenities are what awaits travelers to the Hard Rock Hotel Daytona Beach. To see the authentic experiences being shared firsthand, visit https://hardrockhotels.stories.travel/gallery, or reserve your stay today at https://www.hardrockhotels.com/daytona-beach. To get started with Flip.to for hotels, the advocacy platform for that reaches, converts and inspires and entirely new global audience every day, take a tour, or see other hotels shining on the platform, here: https://www.flip.to/customers/hotels. Hard Rock Hotel Daytona Beach brings the global brand’s iconic vibe and energetic beat to a wide stretch of the world-famous Atlantic shoreline. The 200-room beachfront property features renowned, brand-exclusive offerings and amenities, including The Sound of Your Stay® music program, offering complimentary use of Fender guitars and Crosley record players for in-room jam sessions, as well as a renowned full-service Rock Spa® and Salon, a Rock Shop® and a Body Rock® Fitness Center. The hotel also includes the signature Sessions restaurant and bar, the open-air Wave Terrace and 20,000 square feet of indoor and outdoor meeting space, including a versatile ballroom terrace. The property’s resort-style beachfront pool features an expansive oceanfront party deck and outdoor pool bar and grill. Located at 918 N. Atlantic Avenue, just 15 minutes from Daytona International Airport, Hard Rock Hotel Daytona Beach is owned by Summit Hospitality Management Group. For more information, visit www.hrhdaytonabeach.com. With venues in 75 countries, including 183 cafes, 27 hotels and 12 casinos, Hard Rock International (HRI) is one of the most globally recognized companies. Beginning with an Eric Clapton guitar, Hard Rock owns the world’s most valuable collection of music memorabilia, which is displayed at its locations around the globe. Hard Rock is also known for its collectible fashion and music-related merchandise and Hard Rock Live performance venues. HRI owns the global trademark for all Hard Rock brands. The company owns, operates and franchises Cafes in iconic cities including London, New York, San Francisco, Sydney and Dubai. HRI also owns, licenses and/or manages hotel/casino properties worldwide. Destinations include the company’s two most successful Hotel and Casino properties in Tampa and Hollywood, FL., both owned and operated by HRI parent entity The Seminole Tribe of Florida, as well as other exciting locations including Atlantic City, Bali, Cancun, Daytona Beach, Ibiza, Orlando, Shenzhen and San Diego. Upcoming new Hard Rock Cafe locations include, Maldives, Manila, Malaga, Georgetown, Fortaleza, Rosario and Chengdu. New Hard Rock Hotel, Casino or Hotel & Casino projects include Berlin, Budapest, Dublin, London, Los Cabos, Madrid, Maldives, New York City, Ottawa, Sacramento, Dalian and Haikou in China. In 2018, Hard Rock International was recognized as a Forbes Magazine Top Employer for Women and Land Operator of the Year at the Global Gaming Awards. For more information on Hard Rock International visit www.hardrock.com. StayNTouch, Fuel and Flip.to share on how collaboration offers a guide to exceeding evolving traveler demands in today’s digital economy.